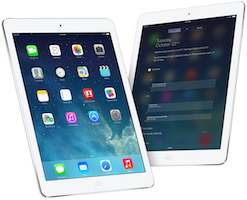 The Wi-Fi only version of iPad Air should be priced around Rs 43,100, Rs 50,300 and Rs 57,500 for the 32GB, 64GB and 128GB models respectively. In comparison, the Wi-Fi+cellular version should been priced around Rs 45,300, Rs 52,500, Rs 59,700 and Rs 66,900 for the 16GB, 32GB, 64GB and 128GB model respectively. The Wi-Fi only versionof iPad mini with Retina display should be priced around Rs 35,900, Rs 43,100, and Rs 50,500 for the 32GB, 64GB and 128GB models respectively. In comparison, the Wi-Fi+cellular version should be priced around Rs 38,100, Rs 45,300, Rs 52,500 $729 and Rs 59,700 for the 16GB, 32GB, 64GB and 128GB model respectively. The latest addition to the iPad family features a 9.7 inch LED-backlit multi-touch touchscreen retina display with IPS technology (2048Ã—1536 resolution) and 264 ppi pixel density and is powered by Apple's A7 processor. It will run on the iOS 7 operating system and this one also comes in 16GB, 32 GB, 64 GB and 128GB of internal storage. iPad Air also sports a 5 megapixel auto focus iSight camera that can record full high definition videos (1080p) with 3x zoom, and a front-facing 1.2 megapixel FaceTime camera that can also record HD videos (720p). The rear camera comes with five-element lens, backside illumination, and f/2.4 aperture. On the connectivity front, it has Bluetooth 4.0 and comes in a Wi-Fi only and a Wi-Fi+cellular (supports a nano-SIM) model. Since it has a 10 inch screen, it measures 240mm x 169.5mm x 7.5mm and weighs 469 gm (478 gm for the Wi-Fi+cellular model), making it thinner (1.9mm) and lighter (183 gm) than its predecessor. According to the company, the iPad Air is 20 per cent thinner and 28 per cent lighter than the fourth generation iPad, and with a 43 per cent narrower bezel, the borders of iPad Air are dramatically thinner. Its battery can provide up to 10 hours of web surfing (on Wiâ€‘Fi), video watching and music. The company has also done away with the earlier connecter and added a lightning port in the device. The new iPad mini features a 7.9 inch LED-backlit multi-touch touchscreen retina display with IPS technology (2048Ã—1536 resolution) and 326 ppi pixel density and is powered by Apple's A7 processor. It will run on the iOS 7 operating system and users can opt for 16GB, 32 GB and 64 GB of internal memory that is non-expandable. The company has also added a 128GB model to the mix. The device sports a 5 megapixel auto focus iSight camera that can record full high definition videos (1080p) with 3x zoom, and a front-facing 1.2 megapixel FaceTime camera that can also record HD videos (720p). The rear camera comes with five-element lens, backside illumination, and f/2.4 aperture. On the connectivity front, it has Bluetooth 4.0 and comes in a Wi-Fi only and a Wi-Fi+cellular (supports a Nano-SIM) model. 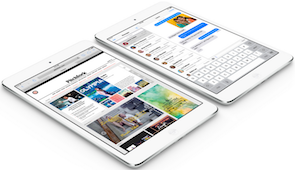 The iPad mini measures 200mm x 134.7mm x 7.2mm and weighs 331 gm (341 gm for the Wi-Fi+cellular model), making it slightly thicker (0.3mm) and heavier (23 gm) than its predecessor. According to the company, its battery can provide up to 10 hours of web surfing (on Wiâ€‘Fi), video watching and music. The company has also done away with the earlier connecter and added a lightning port in the device. The company has also launched new custom-designed polyurethane 'Smart Covers' for iPad Air and iPad mini with retina display that will be available in a range of colours including blue, green, pink, yellow, black and red. It is also offering redesigned aniline-dyed leather 'Smart Cases' for the iPads that will be available in six colours (yellow, beige, blue, brown, black and red) for iPad Air and iPad mini.